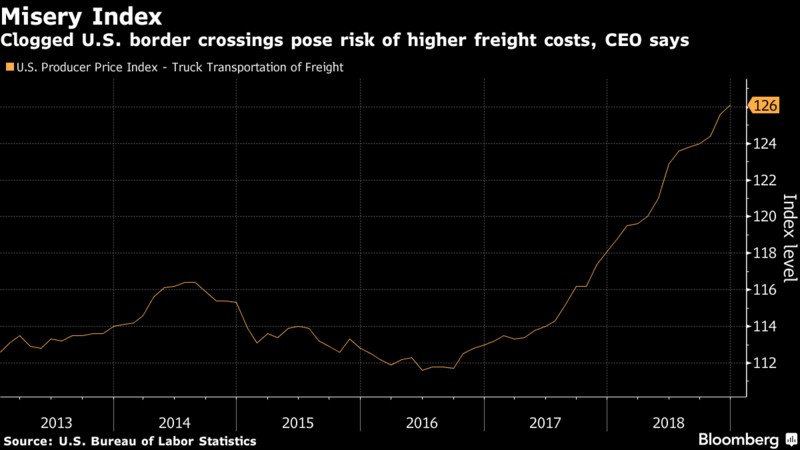 A protracted government shutdown threatens to add backups at U.S. borders that would boost freight rates, adding to costs for consumers and commodity shippers already coping with tariffs, according to the chief of a logistics firm. The government closure is already the longest on record, with few signs that a breakthrough is imminent in the stalemate. Some airport security lanes were closed as the Transportation Security Administration grappled with absenteeism, and concern is mounting that similar backups will grow at checkpoints on highways and ports. “Just to rewind for a second, you’re already seeing TSA shutting down lanes in certain sections of airports: What’s going to happen at the border crossings?” said Anton Posner, the chief executive officer of Mercury Resources LLC, a supply-chain management and consulting firm. Government agencies clear goods at the border, and delays could mean shippers would lose business, Posner said in an interview at an aluminum-industry conference in San Diego.